Has anyone seen my personal life? On the heels of two weekends of volunteer commitments I find myself consumed by work stuff as well as a couple of personal items so this site will remain quiet for another day or so. Hopefully back to our regularly scheduled programming (such as it is) by early next week. Until then, enjoy one or two of my favorite posts. 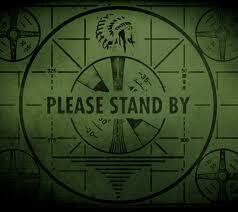 Haven't seen your personal life, but have seen the "Please Stand By" on many occasions. Seems like a life time ago. I think your personal life ran off with my personal life since we keep showing up in the same places.... if you find yours, would you kindly return mine :) Feeling your pain! Peace, Snow, Skunk, Turkey, Fruitcake. There just isn't enough time. Wow, I haven't seen the Indian since I left Upstate PA. I know what you mean about personal time; I'm on call next week, and I caught no fish this week! Yeah, that's an oldy. Good luck this week.